Franklin Square residents Florence and John Scarinci love dogs. Not just any dogs, though. They are particularly fond of service dogs. with physical or mental disabilities since 1975. Last year, Canine Companions placed more than 400 service dogs, including 66 animals in the Northeast, from their center in Medford, N.Y. One of those, a female pure-bred Labrador named Taylor VII, raised by the Scarincis, went to New Hampshire resident Arika Zielfelder. Zielfelder was born with spina bifida, a condition characterized by an incomplete closing of the vertebrae and membranes around the spinal cord. Now 27, she received her first service dog when she was a junior in high school. “I was always pretty independent, but before I had a dog I needed people to help me,” she said. “I had to have someone with me when I went to the store to carry groceries for me, and when people approached me, the conversations tended to be disability-based. 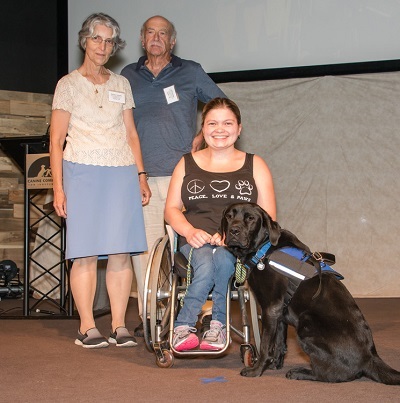 Things were harder and more time-consuming.” Thanks to Canine Companions and her first service dog, Faxon, Zielfelder was able to attend the University of New Hampshire on her own and to live the life of an ordinary college student. Canine Companions trains dogs for a variety of roles. They may be service dogs, like Taylor, but they also train hearing dogs, facility dogs and companion dogs, among others. They have also begun a pilot program to train dogs for people suffering from PTSD. “Right now, the PTSD program is based in California,” Florence Scarinci said. But Canine Companions has provided companion dogs to returning veterans for many years. The Scarincis started as puppy raisers 20 years ago and have raised six dogs to date. “The first dog was returned, so we adopted it back,” she said. “The Town of Hempstead doesn’t allow more than three dogs, so we had to wait before we could raise another puppy.” When one of their animals died, they resumed training. “We’ve had puppies without interruption since then,” she said. Puppy raisers receive their animals at about eight weeks, and for the next 18 to 20 months, they teach the animals the 30 basic commands they will need when they are turned over to the professional trainers, Scarinci said. These certified trainers then assess the dogs’ capabilities and give them the additional specialized commands they will need. Service dogs like Faxon and Taylor have to be able to pull wheelchairs, carry items and turn light switches on and off, for example. Hearing dogs need to be able to recognize their companions’ names or respond to doorbells. PTSD dogs learn to interrupt violent nightmares, assess moods and walk behind, because many combat veterans are wary of anything behind them, Scarinci explained. Having the dogs “on their six” helps them feel more secure. When the initial training is completed, both animals and trainers then return to their regional service centers for matriculation, where the dogs are turned over to professional trainers for a final six to nine months. The Scarincis’ current dog, a female named Odelle II, will be ready for matriculation at the end of the summer. Zielfelder’s two dogs “have made a huge difference in my life,” she said. “I’m able to be completely independent.” Zielfelder drives, works full time in the personnel department at Walmart, and usually lives in her own apartment. Canine Companions has its own breeding program where golden retrievers, Labradors and Lab-golden crosses are bred. “Most of our dogs are crosses,” Knatz said. They combine the strength, intelligence and eagerness to please that make them ideal as service dogs. It costs roughly $50,000 to train the dogs, but Canine Companions provides them at no cost to individuals or their families. The organization retains ownership of the dogs, but once placed, they generally stay with their companions for life. Dogs and their human companions return to the regional service centers for periodic refreshers. And the dogs adapt to the evolving needs of their partners. Scarinici told of a veteran who was losing his hearing as a result of a traumatic brain injury suffered while on active duty. Although not trained as a hearing dog, his animal gradually understood what was needed. For more information about Canine Companions for Independence, go to www.cci.org or call (800) 572-BARK (2275).